Obama’s economy better than Bush’s? Not yet, but it could be when all is said and done. I found a good source for historical job data and was able to compare job growth during the George W. Bush administration to growth during the Barack Obama administration. To be fair, I’ll exclude the early 2000s recession and the late 2000s recession by counting from the end of the 2001-2002 recession to the beginning of the Lesser Depression, and then from the end of that until present. These are net jobs, meaning any month of job loss will count against the total. In the 68 months between June of 2002 and January of 2008, the economy added 7,622,000 jobs. That’s an average of 112,000 jobs per month. In the 37 months between March of 2010 and March of 2013, the economy added 5,875,000 jobs for an average of 159,000. GDP under Bush averaged 1.4%, with a high of 2.2% in 2003Q3 and a low of 0.6% in the 2002Q4. 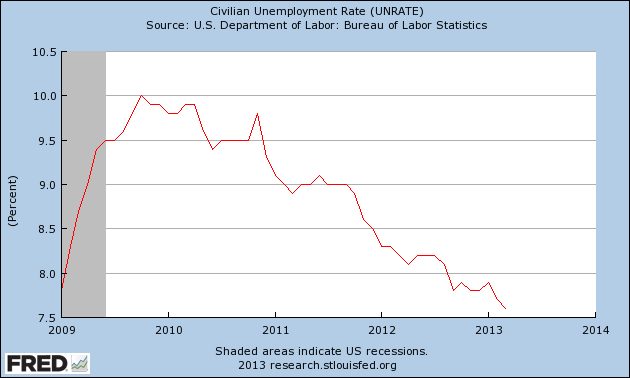 The average under Obama so far has been 1.0% with a high of 1.4% in the 2012Q3 followed by a low of 0.3% in 2012Q4. For raw numbers, the Bush administration (post-recession) began at $10.7 trillion and ended at $14.4 trillion. The Obama administration began (again, post-recession) at $13.8 trillion and 2012Q4 landed around $15.8 trillion. Things get a little complex at this point because we’re talking about a number that (almost) always increases. 1% growth can be more than 1.4% if 1% comes after and endures long enough. Movement from $10.7 trillion to $14.4 trillion is an increase of 25.7% (rounded). That’s a lot, but it did take around 68 months to get there. $13.8 trillion to $15.8 trillion is 12.6% but in 37 months. And it actually gets harder, because the Congressional Budget Office (Wall Street analysts seem to agree on this) expect 3%+ GDP by 2016, which is quite a step up from the ~1% we’ve been stuck with these past three years and is more than what we saw during most of the Bush administration. This one needs a caveat. **Is projected to be a tie by the time that Barack Obama leaves office with economic expansion of about 25%. This one is easy. The Bush administration inherited a great economy in January of 2001 that melted quickly after. 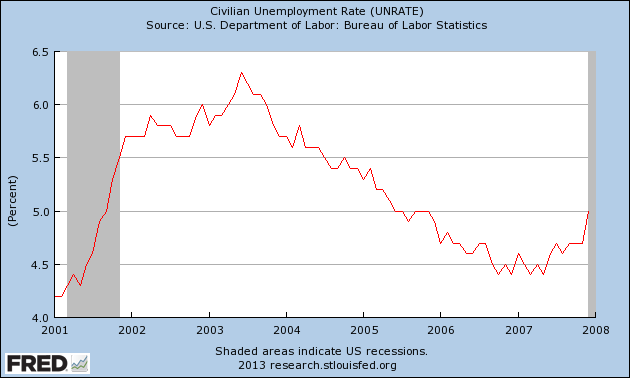 Civilian unemployment was 4.2% before the early 2000s recession ran it up to 5.8%. It held steady for a bit after that recession and eventually climbed again to 6.3% in the summer of 2003 before hitting a low of 4.4% in late 2006. Unemployment actually began to slowly climb in 2007 as the economy began to sputter, with six months under 100,000 new jobs and two months of actual job loss before the Lesser Depression even began. The Bush administration inherited a 4.2% unemployment rate, saw it peak at 6.2% thanks to a recession, and it took 40 months for it to bottom out at 4.4% (it never did return to 4.2%). Despite the Lesser Depression being significantly worse, it took roughly the same amount of time for the economy to recover to where it started with each administration, at least when it comes to unemployment. Holding it against President Obama for having such a high rate today is cutting out a lot of important information. With unemployment projected to hit 4-5% in 2016, it’ll have taken about 87 months to bring it down from 10%. A 6 point drop in 87 months is a painful 0.06 points per month, but that’s still actually better than the 0.04 points per month during the Bush administration. **Is projected to be an Obama win by the time he leaves office. The book isn’t closed on this one, but by 2016 it could be a win on the economy for Obama in all three measures, even with all the unnecessary pain the country has endured.